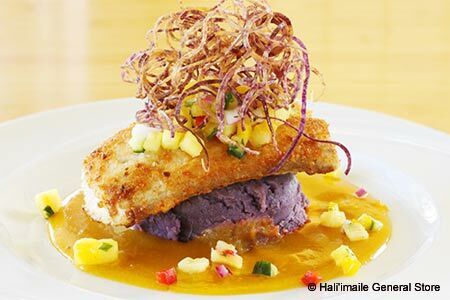 Sophisticated tourists and locals alike make the scenic drive to feast on Hali'imaile's variety of entrées and desserts. : Surrounded by pineapple fields in cool upcountry Maui, 30 minutes from the resorts at Wailea, this charming and authentically rustic store is where Joe and Beverly Gannon purvey their own delicious style of Hawaii Regional cuisine. The delightful country atmosphere boasts an open kitchen and floor-to-ceiling shelves stocked with giftwares. The large old rooms provide a lively atmosphere in which to dine. The copper bar, the artwork and the giant, tropical floral arrangements are pleasing. Sophisticated tourists love to make the scenic drive to feast on Beverly's sashimi napoleon, boboli pizza with her secret crab-dip topping, and lovely fresh grilled seafood. Sophisticated locals flock there as well. A favorite is paniolo ribs, meaty pork ribs served with a unique barbecue sauce, creamy garlic mashed potatoes and fresh vegetables. Joe goes above and beyond his duties at their Joe's Bar & Grill in Wailea, and looks after the wine list, which is filled with attractive, inexpensive and well-selected bottlings. The Gannons' daughter Cheech is the pastry chef here and at Joe's. Try her chocolate macadamia nut pie.